Israel’s objectives from the war on Gaza were set long before its launch: to remove the Hamas movement and government, achieve the reinstallation of the Fatah leader, Mahmoud Abbas, in Gaza, and end the armed resistance. Two other objectives were not announced. First, restore the Israeli public’s wavering confidence in its armed forces after its defeat by Hizballah in 2006. Second, boost the coalition government in the coming elections. Accordingly, we declare that Israel lost, and lost decisively. What did it achieve? The killing of large numbers of civilians, children and women, and the destruction of homes, ministry buildings and other infrastructure with the most advanced United States weapons and other internationally banned chemical and phosphorous elements. Almost 2,000 children were killed and injured in desperate pursuit of political goals. Many international organizations called these attacks war crimes, yet barely a word of denunciation was uttered by any Western leader. What message does the European Union mean to send Palestinians by its shameful silence on these crimes, when it speaks incessantly on human rights? If anything, the last three weeks, and previous 18 months, have proved that the Palestinians can never be broken by either starvation, economic strangulation or brutal attack. European leaders have only one option: to recognize the outcome of a democratic process they had called for and supported. 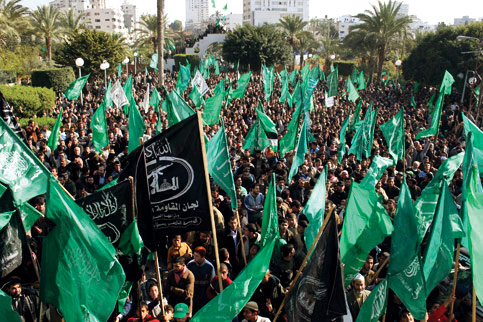 The aggression failed to undermine or weaken the Hamas-led government or turn Palestinians against Hamas. If anything, public support is stronger than ever in Palestine and worldwide. Hamas’ military capabilities have not been hurt, either. This explains Israel scurrying to sign such a strange agreement with the U.S. to stop arms reaching Hamas. It is doomed to fail. As the former Israeli chief of staff Moshe Yaalon and Benjamin Netanyahu agreed, Israeli forces failed to achieve their objectives. Why is Israel allowed a continuous flow of the most lethal arms, including banned weapons, while national resistance movements are denied the means of defense? International laws permit occupied nations to resist their occupiers, and that is a right we aim to utilize to the full. Israel must accept the reality that it is incapable of breaking the Palestinian resistance. Similarly, Europe must accept that bringing back Abbas on an Israeli tank is not an option. Nor are attempts to win by “diplomacy” what the might of the Israeli military failed to secure by force. To state that all aid for Gaza reconstruction must go through the illegal government of appointed Palestinian Authority Prime Minister Salam Fayyad suggests there is no end to some parties’ exploitation of Palestinians. We will never cease to pursue national unity, but we will never allow it to be attained by compromising Palestinian rights. And to President Obama we say: The wave of hope that met your election was heavily dampened by your silence on the Gaza massacre. This was compounded by your pre-election statement siding with the Israeli settlers of Sderot. You would do well to know the history of the places of which you speak. Sderot, which may be known to some as an Israeli town, lies on the ruins of Najd, a Palestinian village ransacked in May 1948 by Zionist terrorist gangs. Villagers were forced from their beds and homes with nothing but the clothes they were wearing, rendering them refugees for the next 61 years. That is the story of Sderot. It is never a good start to get your tyrant and victims mixed up, but there is still room for a revival of passionate optimism. Only if you decide to fairly address the issue of the 6 million Palestinian refugees and the ending of occupation of Palestinian lands, including Jerusalem, will you be able to start a new relationship with the Muslim world. Mousa Abu Marzook is deputy chief of the Hamas political bureau and can be reached at mousa.abumarzook@gmail.com. This essay was first published in the UK Guardian’s Comment is Free and the following day on The Electronic Intifada. “In just two short days I met with families who were given minutes to evacuate their homes and are now living in overcrowded U.N. schools; I saw the ruins of bombed greenhouses; I looked out the window at fields and roads torn up by the tread of Israeli tanks; and I visited two universities where MECA supports students with scholarships – severely damaged by Israeli bombs. “In Zaytoun, I saw families gathering wood from charred trees. The almost two-year blockade of Gaza has deprived people cooking gas, so these terrified families build fires to keep warm and cook the little food they can get. “I talked to people on the street who told stories of wild dogs coming to eat their dead neighbors, relatives bleeding to death because Israel would not allow emergency workers into the area, and Israeli soldiers entering homes to beat and kill. You can’t win the Jews with truth so then you try to fight them with your lies. You remind me the Nazis that invented theories against the Jews in order to ‘justify’ their continuous efforts to annihilate them. Now the Muslims do the same, with the help of some few Jews. The Palestinian Arabs are imbued with the murderous spirit of their 20th century leader Haj Muhammed Amin al-Husseini who embarked on his career of killing Jews in 1920 and then sojourned with Hitler during WW2 showing the Nazi dictator just how to commit genocide. Let’s tell the truth for once.